Site/plume geochemical information is needed for reactive barrier implementation and to further our understanding of the expected lifetime of these systems. It has been shown, for example, that water passing through a reactive barrier of zero-valent iron undergoes radical geochemical changes, including a change in pH up to 9 or 10, elimination of oxygen with Eh reduction to minus several hundred millivolts, and a reduction in carbonate alkalinity. Often, sulfate is reduced to sulfide and dissolved iron appears. Other changes might be observed, dependant upon the contaminants being reacted. Some of the geochemical changes can result in precipitation on the reactant surfaces, potentially reducing the reactivity and permeability of the reactive zone over time. Therefore waters high in carbonate might result in significant buildup of calcite (CaCO3) or siderite (FeCO3). In addition, hydroxides can also be expected to precipitate. Of particular potential importance is the precipitation of ferric hydroxide (FeOH)3 at the upgradient reactive zone interface, due to the reaction of dissolved oxygen with the iron. At this time, the significance of these reactions over the lifetime of a field installation is not fully understood but column plugging in lab studies, particularly at the influent where dissolved O2 contacts the Fe0, has been observed. 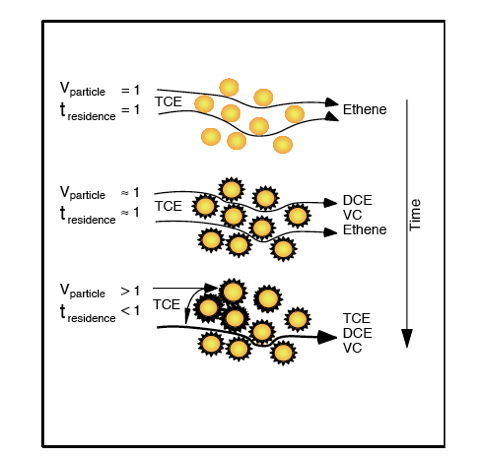 To illustrate these effects, the upper graphic in the figure below depicts the flow of TCE-contaminated water through a portion of a reactive barrier shortly after installation. TCE enters and ethylene exits, with a velocity of 1 and a residence time of 1, exactly as the wall was designed. In the middle graphic precipitates have begun to significantly coat the iron particles, limiting access of the TCE to the surface for dechlorination reactions. The velocity is still about one, as is the residence time, however in this system a residence time of one doesn't provide sufficient contact with the surfaces due to the coatings. This results in the daughter products of incomplete dechlorination appearing downgradient. The bottom graphic shows precipitation has blocked the pore spaces between some iron particles. Now the entire ground water flux must pass through the remaining open channels, making the velocity greater than one, the residence time less than one, and dechlorination incomplete. This type of plugging could also result in upgradient head increase and flow around the barrier rather than through it.